This module contains the features of CSS level 3 relating to the <image> type and some replaced elements. It includes and extends the functionality of CSS level 2 [CSS2]. The main extensions compared to CSS2.1 are the generalization of the <url> type to the <image> type, several additions to the <image> type, a generic sizing algorithm for images and other replaced content in CSS, definitions for interpolating several <image> types, and several properties controlling the interaction of replaced elements and CSS’s layout models. GitHub Issues are preferred for discussion of this specification. When filing an issue, please put the text “css-images” in the title, preferably like this: “[css-images] …summary of comment…”. All issues and comments are archived, and there is also a historical archive. In CSS Levels 1 and 2, image values, such as those used in the background-image property, could only be given by a single URL value. This module introduces additional ways of representing 2D images, for example as a gradient. This module also defines several properties for manipulating raster images and for sizing or positioning replaced elements such as images within the box determined by the CSS layout algorithms. It also defines in a generic way CSS’s sizing algorithm for images and other similar replaced elements. This subsection (above) is not normative. None of the properties defined in this module, only image-rendering applies to ::first-line and ::first-letter. This specification follows the CSS property definition conventions from [CSS2]. Value types not defined in this specification are defined in CSS Level 2 Revision 1 [CSS2]. Other CSS modules may expand the definitions of these value types: for example [CSS-VALUES-3], when combined with this module, adds the initial keyword as a possible property value. An <image> can be used in many CSS properties, including the background-image, list-style-image, cursor properties [CSS2] (where it replaces the <url> component in the property’s value). The simplest way to indicate an image is to reference an image file by URL. This can be done with the url() notation, defined in [CSS-VALUES-3]. If the UA cannot download, parse, or otherwise successfully display the contents at the URL as an image (i.e. if the image is not fully fully decodable) it must be treated as an invalid image. A gradient is drawn into a box with the dimensions of the concrete object size, referred to as the gradient box. However, the gradient itself has no intrinsic dimensions. For example, if you use a gradient as a background, by default the gradient will draw into a gradient box the size of the element’s padding box. If background-size is explicitly set to a value such as 100px 200px, then the gradient box will be 100px wide and 200px tall. Similarly, for a gradient used as a list-style-image, the box would be a 1em square, which is the default object size for that property. Gradients are specified by defining the starting point and ending point of a gradient line (which, depending on the type of gradient, may geometrically be a line, or a ray, or a spiral), and then specifying colors at points along this line. The colors are smoothly blended to fill in the rest of the line, and then each type of gradient defines how to use the color of the gradient line to produce the actual gradient. A linear gradient is created by specifying a straight gradient line, and then several colors placed along that line. The image is constructed by creating an infinite canvas and painting it with lines perpendicular to the gradient line, with the color of the painted line being the color of the gradient line where the two intersect. This produces a smooth fade from each color to the next, progressing in the specified direction. The first argument to the function specifies the gradient line, which gives the gradient a direction and determines how color-stops are positioned. It may be omitted; if so, it defaults to to bottom. For the purpose of this argument, 0deg points upward, and positive angles represent clockwise rotation, so 90deg point toward the right. The unit identifier may be omitted if the <angle> is zero. If the argument is to top, to right, to bottom, or to left, the angle of the gradient line is 0deg, 90deg, 180deg, or 270deg, respectively. If the argument instead specifies a corner of the box such as to top left, the gradient line must be angled such that it points into the same quadrant as the specified corner, and is perpendicular to a line intersecting the two neighboring corners of the gradient box. This causes a color-stop at 50% to intersect the two neighboring corners (see example). Starting from the center of the gradient box, extend a line at the specified angle in both directions. 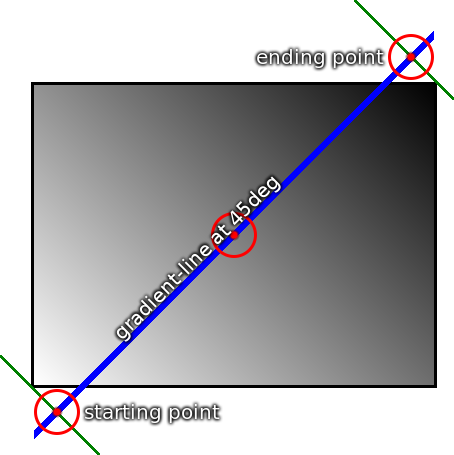 The ending point is the point on the gradient line where a line drawn perpendicular to the gradient line would intersect the corner of the gradient box in the specified direction. The starting point is determined identically, but in the opposite direction. Note: It is expected that the next level of this module will provide the ability to define the gradient’s direction relative to the current text direction and writing-mode. This example illustrates visually how to calculate the gradient line from the rules above. This shows the starting and ending point of the gradient line, along with the actual gradient, produced by an element with background: linear-gradient(45deg, white, black);. Notice how, though the starting point and ending point are outside of the box, they’re positioned precisely right so that the gradient is pure white exactly at the corner, and pure black exactly at the opposite corner. That’s intentional, and will always be true for linear gradients. The gradient’s color stops are typically placed between the starting point and ending point on the gradient line, but this isn’t required: the gradient line extends infinitely in both directions. The starting point and ending point are merely arbitrary location markers, the starting point defining where 0%, 0px, etc are located when specifying color-stops, and the ending point defines where 100% is located. Color-stops are allowed to have positions before 0% or after 100%. The color of a linear gradient at any point is determined by finding the unique line passing through that point that is perpendicular to the gradient line. The point’s color is the color of the gradient line at the point where this line intersects it. All of the following linear-gradient() examples are presumed to be backgrounds applied to a box that is 200px wide and 100px tall. This demonstrates the use of an angle in the gradient. Note that, though the angle is not exactly the same as the angle between the corners, the gradient line is still sized so as to make the gradient yellow exactly at the upper-left corner, and blue exactly at the lower-right corner. This demonstrates a corner-to-corner gradient specified with keywords. Note how the gradient is red and blue exactly in the bottom-left and top-right corners, respectively, exactly like the second example. Additionally, the angle of the gradient is automatically computed so that the color at 50% (in this case, white) stretches across the top-left and bottom-right corners. In a radial gradient, rather than colors smoothly fading from one side of the gradient box to the other as with linear gradients, they instead emerge from a single point and smoothly spread outward in a circular or elliptical shape. A radial gradient is specified by indicating the center of the gradient (where the 0% ellipse will be) and the size and shape of the ending shape (the 100% ellipse). Color stops are given as a list, just as for linear-gradient(). Starting from the gradient center and progressing towards (and potentially beyond) the ending shape, uniformly-scaled concentric ellipses are drawn and colored according to the specified color stops. Note: A future level may add the ability to move the focus of the gradient, as in the original -webkit-gradient() function. See proposal tracked in Issue 1575 for "from <position>" and "from offset <offset>". Determines the center of the gradient. The <position> value type (which is also used for background-position) is defined in [CSS-VALUES-3], and is resolved using the center-point as the object area and the gradient box as the positioning area. If this argument is omitted, it defaults to center. Can be either circle or ellipse; determines whether the gradient’s ending shape is a circle or an ellipse, respectively. If <ending-shape> is omitted, the ending shape defaults to a circle if the <size> is a single <length>, and to an ellipse otherwise. Determines the size of the gradient’s ending shape. If omitted it defaults to farthest-corner. It can be given explicitly or by keyword. For the purpose of the keyword definitions, consider the gradient box edges as extending infinitely in both directions, rather than being finite line segments. If the ending-shape is an ellipse, its axises are aligned with the horizontal and vertical axises. The ending shape is sized so that it exactly meets the side of the gradient box closest to the gradient’s center. If the shape is an ellipse, it exactly meets the closest side in each dimension. The ending shape is sized so that it passes through the corner of the gradient box closest to the gradient’s center. If the shape is an ellipse, the ending shape is given the same aspect-ratio it would have if closest-side were specified. Gives the radius of the circle explicitly. Negative values are invalid. Note: Percentages are not allowed here; they can only be used to specify the size of an elliptical gradient, not a circular one. This restriction exists because there is are multiple reasonable answers as to which dimension the percentage should be relative to. A future level of this module may provide the ability to size circles with percentages, perhaps with more explicit controls over which dimension is used. Gives the size of the ellipse explicitly. The first value represents the horizontal radius, the second the vertical radius. Percentages values are relative to the corresponding dimension of the gradient box. Negative values are invalid. Color-stops are placed on a gradient line shaped like a ray (a line that starts at one point, and extends infinitely in a one direction), similar to the gradient line of linear gradients. The gradient line’s starting point is at the center of the gradient, and it extends toward the right, with the ending point on the point where the gradient line intersects the ending shape. A color-stop can be placed at a location before 0%; though the negative region of the gradient line is never directly consulted for rendering, color stops placed there can affect the color of non-negative locations on the gradient line through interpolation or repetition (see repeating gradients). For example, radial-gradient(red -50px, yellow 100px) produces an elliptical gradient that starts with a reddish-orange color in the center (specifically, #f50) and transitions to yellow. Locations greater than 100% simply specify a location a correspondingly greater distance from the center of the gradient. The color of the gradient at any point is determined by first finding the unique ellipse passing through that point with the same center, orientation, and ratio between major and minor axises as the ending-shape. The point’s color is then the color of the positive section of the gradient line at the location where this ellipse intersects it. Render as if the ending shape was a circle whose radius was an arbitrary very small number greater than zero. This will make the gradient continue to look like a circle. Render as if the ending shape was an ellipse whose height was an arbitrary very large number and whose width was an arbitrary very small number greater than zero. This will make the gradient look similar to a horizontal linear gradient that is mirrored across the center of the ellipse. It also means that all color-stop positions specified with a percentage resolve to 0px. Render as if the ending shape was an ellipse whose width was an arbitrary very large number and whose height was an arbitrary very small number greater than zero. This will make the gradient look like a solid-color image equal to the color of the last color-stop, or equal to the average color of the gradient if it’s repeating. All of the following examples are applied to a box that is 200px wide and 100px tall. Here we illustrate a closest-side gradient. In addition to linear-gradient() and radial-gradient(), this specification defines repeating-linear-gradient() and repeating-radial-gradient() values. These notations take the same values and are interpreted the same as their respective non-repeating siblings defined previously. When rendered, however, the color-stops are repeated infinitely in both directions, with their positions shifted by multiples of the difference between the last specified color-stop’s position and the first specified color-stop’s position. For example, repeating-linear-gradient(red 10px, blue 50px) is equivalent to linear-gradient(..., red -30px, blue 10px, red 10px, blue 50px, red 50px, blue 90px, ...). Note that the last color-stop and first color-stop will always coincide at the boundaries of each group, which will produce sharp transitions if the gradient does not start and end with the same color. If the distance between the first and last color-stops is non-zero, but is small enough that the implementation knows that the physical resolution of the output device is insufficient to faithfully render the gradient, the implementation must find the average color of the gradient and render the gradient as a solid-color image equal to the average color. If the distance between the first and last color-stops is zero (or rounds to zero due to implementation limitations), the implementation must find the average color of a gradient with the same number and color of color-stops, but with the first and last color-stop an arbitrary non-zero distance apart, and the remaining color-stops equally spaced between them. Then it must render the gradient as a solid-color image equal to that average color. If the width of the ending shape of a repeating radial gradient is non-zero and the height is zero, or is close enough to zero that the implementation knows that the physical resolution of the output device is insufficient to faithfully render the gradient, the implementation must find the average color of the gradient and render the gradient as a solid-color image equal to the average color. Note: The Degenerate Radial Gradients section describes how the ending shape is adjusted when its width is zero. Define list as an initially-empty list of premultiplied RGBA colors, and total-length as the distance between first and last color stops. For each adjacent pair of color-stops, define weight as half the distance between the two color-stops, divided by total-length. 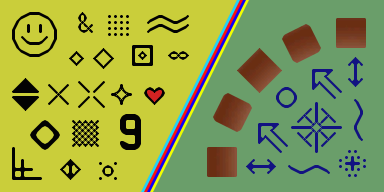 Add two entries to list, the first obtained by representing the color of the first color-stop in premultiplied sRGBA and scaling all of the components by weight, and the second obtained in the same way with the second color-stop. Sum the entries of list component-wise to produce the average color, and return it. Note: As usual, implementations may use whatever algorithm they wish, so long as it produces the same result as the above. The colors in gradients are specified using color stops. A color stop is a combination of a color and a position. While every color stop conceptually has a position, the position can be omitted in the syntax, in which case it gets automatically filled in by the user agent; see below for details. The color stops for a gradient are specified in a color stop list, which is a list of two or more color stops, specified in geometric order. Color stops are placed on a gradient line, which defines the colors at every point of a gradient. The gradient function defines the shape and length of the gradient line, along with its starting point and ending point. Percentages refer to the length of the gradient line between the starting point and ending point, with 0% being at the starting point and 100% being at the ending point. Lengths are measured along the gradient line from the starting point in the direction of the ending point. Color stops are usually placed between the starting point and ending point, but that’s not required: the gradient line extends infinitely in both directions, and a color stop can be placed at any position on the gradient line. When the position of a color stop is omitted, it is positioned automatically halfway between the two surrounding stops. If multiple stops in a row lack a position, they space themselves out equally. If a color stop has a position that is less than the specified position of any color stop before it in the list, set its position to be equal to the largest specified position of any color stop before it. At each color stop position, the line is the color of the color stop. Between two color stops, the line’s color is linearly interpolated between the colors of the two color stops, with the interpolation taking place in premultiplied RGBA space. Before the first color stop, the line is the color of the first color stop. After the last color stop, the line is the color of the last color stop. If multiple color stops have the same position, they produce an infinitesimal transition from the one specified first in the rule to the one specified last. In effect, the color suddenly changes at that position rather than smoothly transitioning. Below are several pairs of gradients. The latter of each pair is a manually "fixed-up" version of the former, obtained by applying the above rules. For each pair, both gradients will render identically. The numbers in each arrow specify which fixup steps are invoked in the transformation. Note: It is recommended that authors not mix different types of units, such as px, em, or %, in a single rule, as this can cause a color stop to unintentionally try to move before an earlier one. For example, the rule background-image: linear-gradient(yellow 100px, blue 50%) wouldn’t require any fix-up as long as the background area is at least 200px tall. If it was 150px tall, however, the blue color stop’s position would be equivalent to "75px", which precedes the yellow color stop, and would be corrected to a position of 100px. Additionally, since the relative ordering of such color stops cannot be determined without performing layout, they will not interpolate smoothly in animations or transitions. Note: The definition and implications of "premultiplied" color spaces are given elsewhere in the technical literature, but a quick primer is given here to illuminate the process. Given a color expressed as an rgba() 4-tuple, one can convert this to a premultiplied representation by multiplying the red, green, and blue components by the alpha component. For example, a partially-transparent blue may be given as rgba(0,0,255,.5), which would then be expressed as [0, 0, 127.5, .5] in its premultiplied representation. Interpolating colors using the premultiplied representations rather than the plain rgba representations tends to produce more attractive transitions, particularly when transitioning from a fully opaque color to fully transparent. Note that transitions where either the transparency or the color are held constant (for example, transitioning between rgba(255,0,0,100%) and rgba(0,0,255,100%), or rgba(255,0,0,100%) and rgba(255,0,0,0%)) have identical results whether the color interpolation is done in premultiplied or non-premultiplied color-space. Differences only arise when both the color and transparency differ between the two endpoints. Images used in CSS may come from a number of sources: from binary image formats (such as gif, jpeg, etc), dedicated markup formats (such as SVG), and CSS-specific formats (such as the linear-gradient() value type defined in this specification). As well, a document may contain many other types of objects, such as video, plugins, or nested documents. These images and objects (just objects hereafter) may offer many types of sizing information to CSS, or none at all. This section defines generically the size negotiation model between the object and the CSS layout algorithms. The term intrinsic dimensions refers to the set of the intrinsic height, intrinsic width, and intrinsic aspect ratio (the ratio between the width and height), each of which may or may not exist for a given object. These intrinsic dimensions represent a preferred or natural size of the object itself; that is, they are not a function of the context in which the object is used. CSS does not define how the intrinsic dimensions are found in general. Raster images are an example of an object with all three intrinsic dimensions. SVG images designed to scale might have only an intrinsic aspect ratio; SVG images can also be created with only an intrinsic width or height. CSS gradients, defined in this specification, are an example of an object with no intrinsic dimensions at all. Another example of this is embedded documents, such as the iframe element in HTML. In general, objects cannot have only two intrinsic dimensions, as any two automatically define the third. However some types of replaced elements, such as form controls, can have an intrinsic width and an intrinsic height, but no intrinsic aspect ratio. If an object (such as an icon) has multiple sizes, then the largest size (by area) is taken as its intrinsic size. If it has multiple aspect ratios at that size, or has multiple aspect ratios and no size, then the aspect ratio closest to the aspect ratio of the default object size is used. Determine this by seeing which aspect ratio produces the largest area when fitting it within the default object size using a contain constraint fit; if multiple sizes tie for the largest area, the widest size is chosen as its intrinsic size. The specified size of an object is given by CSS, such as through the width and height or background-size properties. The specified size can be a definite width and height, a set of constraints, or a combination thereof. The concrete object size is the result of combining an object’s intrinsic dimensions and specified size with the default object size of the context it’s used in, producing a rectangle with a definite width and height. The default object size is a rectangle with a definite height and width used to determine the concrete object size when both the intrinsic dimensions and specified size are missing dimensions. When an object is specified in a document, such as through a url() value in a background-image property or a src attribute on an img element, CSS queries the object for its intrinsic dimensions. Using the intrinsic dimensions, the specified size, and the default object size for the context the object is used in, CSS then computes a concrete object size. (See the following section.) This defines the size and position of the region the object will render in. CSS asks the object to render itself at the concrete object size. CSS does not define how objects render when the concrete object size is different from the object’s intrinsic dimensions. The object may adjust itself to match the concrete object size in some way, or even render itself larger or smaller than the concrete object size to satisfy sizing constraints of its own. Unless otherwise specified by CSS, the object is then clipped to the concrete object size. Currently the rules for sizing objects are described in each context that such objects are used. This section defines some common sizing constraints and how to resolve them so that future specs can refer to them instead of redefining size resolution in each instance. The default sizing algorithm is a set of rules commonly used to find an object’s concrete object size. It resolves the simultaneous constraints presented by the object’s intrinsic dimensions and either an unconstrained specified size or one consisting of only a definite width and/or height. Some object sizing rules (such as those for list-style-image) correspond exactly to the default sizing algorithm. Others (such as those for border-image) invoke the default sizing algorithm but also apply additional sizing rules before arriving at a final concrete object size. If the specified size is a definite width and height, the concrete object size is given that width and height. If the object has an intrinsic aspect ratio, the missing dimension of the concrete object size is calculated using the intrinsic aspect ratio and the present dimension. Otherwise, if the missing dimension is present in the object’s intrinsic dimensions, the missing dimension is taken from the object’s intrinsic dimensions. Otherwise, the missing dimension of the concrete object size is taken from the default object size. If the object has an intrinsic height or width, its size is resolved as if its intrinsic dimensions were given as the specified size. Otherwise, its size is resolved as a contain constraint against the default object size. A contain constraint is resolved by setting the concrete object size to the largest rectangle that has the object’s intrinsic aspect ratio and additionally has neither width nor height larger than the constraint rectangle’s width and height, respectively. A cover constraint is resolved by setting the concrete object size to the smallest rectangle that has the object’s intrinsic aspect ratio and additionally has neither width nor height smaller than the constraint rectangle’s width and height, respectively. In both cases, if the object doesn’t have an intrinsic aspect ratio, the concrete object size is the specified constraint rectangle. The following examples show how the CSS 2.1 and CSS3 Backgrounds & Borders sizing algorithms correspond to concepts defined in this specification. The rules for calculating the concrete object size of a list-style image are defined in CSS2.1§12.5.1. They use the default sizing algorithm with no specified size and a default object size of 1em square. Objects inserted via the CSS2.1 content property are anonymous replaced elements, and are sized the same way. [CSS2] Note that such anonymous elements have all their non-inherited properties (including width, height, etc.) set to their initial values. CSS 2.1 defines the sizing of replaced elements (including those inserted as generated content via content) in sections 10.3.2, 10.4, 10.6.2, and 10.7. [CSS2] The object-fit property defined below defines how the concrete object size corresponds to the element’s used width and height; by default they coincide. The object-fit property specifies how the contents of a replaced element should be fitted to the box established by its used height and width. The replaced content is sized to fill the element’s content box: the object’s concrete object size is the element’s used width and height. The replaced content is sized to maintain its aspect ratio while fitting within the element’s content box: its concrete object size is resolved as a contain constraint against the element’s used width and height. The replaced content is sized to maintain its aspect ratio while filling the element’s entire content box: its concrete object size is resolved as a cover constraint against the element’s used width and height. The replaced content is not resized to fit inside the element’s content box: determine the object’s concrete object size using the default sizing algorithm with no specified size, and a default object size equal to the replaced element’s used width and height. Size the content as if none or contain were specified, whichever would result in a smaller concrete object size. Note: Both none and contain respect the content’s intrinsic aspect ratio, so the concept of "smaller" is well-defined. If the content does not completely fill the replaced element’s content box, the unfilled space shows the replaced element’s background. Since replaced elements always clip their contents to the content box, the content will never overflow. See the object-position property for positioning the object with respect to the content box. An example showing how four of the values of object-fit cause the replaced element (blue figure) to be scaled to fit its height/width box (shown with a green background), using the initial value for object-position. The fifth value, scale-down, in this case looks identical to contain. Note: The object-fit property has similar semantics to the fit attribute in [SMIL10] and the <meetOrSlice> parameter on the preserveAspectRatio attribute in [SVG11]. Note: Per the object size negotiation algorithm, the concrete object size (or, in this case, the size of the content) does not directly scale the object itself - it is merely passed to the object as information about the size of the visible canvas. How to then draw into that size is up to the image format. In particular, raster images always scale to the given size, while SVG uses the given size as the size of the "SVG Viewport" (a term defined by SVG) and then uses the values of several attributes on the root <svg> element to determine how to draw itself. The object-position property determines the alignment of the replaced element inside its box. The <position> value type (which is also used for background-position) is defined in [CSS-VALUES-3], and is resolved using the concrete object size as the object area and the content box as the positioning area. Note: Areas of the box not covered by the replaced element will show the element’s background. This property is likely going to be deprecated and its functionality moved to HTML. At minimum, it will likely lose all but its initial value and from-image. If a picture is taken with a camera turned on its side, or a document isn’t positioned correctly within a scanner, the resultant image may be "sideways" or even upside-down. The image-orientation property provides a way to apply an "out-of-band" rotation to image source data to correctly orient an image. Note: This property is not intended to specify layout transformations such as arbitrary rotation or flipping the image in the horizontal or vertical direction. (See [CSS-TRANSFORMS-1] for a feature designed to do that.) It is also not needed to correctly orient an image when printing in landscape versus portrait orientation, as that rotation is done as part of layout. (See [CSS3PAGE].) It should only be used to correct incorrectly-oriented images. The intrinsic height and width are derived from the rotated rather than the original image dimensions. The height (width) property applies to the vertical (horizontal) dimension of the image, after rotation. No additional rotation is applied: the image is oriented as encoded. If the image has an orientation specified in its metadata, such as EXIF, this value computes to the angle that the metadata specifies is necessary to correctly orient the image. If necessary, this angle is then rounded and normalized as described above for an <angle> value. If there is no orientation specified in its metadata, this value computes to 0deg. Positive values cause the image to be rotated to the right (in a clockwise direction), while negative values cause a rotation to the left. The computed value of the property is calculated by moduloing the value by 1turn (so that it lies in the half-open range [0turn, 1turn)), then rounding it to the nearest quarter-turn, rounding away from 0 (so 45deg rounds to 90deg, etc). Identical to the plain <angle> case, except that after rotation the image is flipped horizontally. If the <angle> is omitted, it defaults to 0deg. Note: This value is only necessary to represent all 8 possible EXIF orientations that from-image can produce. The image-orientation property must be applied before any other transformations, such as using CSS Transforms. The same effect could be achieved with, for example, an angle of -270deg or 450deg. The scaling algorithm is UA dependent. This value does not prevent the image quality from being degraded when the system resources are constrained. It merely expresses a preference that these images should receive extra scaling resources relative to the auto images. If all images on the page have high-quality applied, it’s equivalent to all of them having auto applied—they’re all treated the same. To get the most value out of high-quality, only apply it to the most important images on the page. The name of this value is currently being discussed. The image must be scaled with the "nearest neighbor" or similar algorithm, to preserve a "pixelated" look as the image changes in size. This property does not dictate any particular scaling algorithm to be used. For example, with image-rendering: auto, a user agent might scale images with bilinear interpolation by default, switch to nearest-neighbor interpolation in high-load situations, and switch to a high-quality scaling algorithm like Lanczos interpolation for static images that aren’t moving or changing. Similarly, with 'image-rendering: crisp-edges', a user agent might scale images with nearest-neighbor interpolation by default, and switch to EPX interpolation in low-load situations. The image scaled with crisp-edges. This property previously accepted the values optimizeSpeed and optimizeQuality. These are now deprecated; a user agent must accept them as valid values but must treat them as having the same behavior as pixelated and smooth respectively, and authors must not use them. Interpolation of <image> values is not defined in this level. Implementations must abruptly transition them (at 50% transition progress, like other unsupported interpolations), unless otherwise defined by a future specification. Note: CSS Images Level 4 is expected to define specialized interpolation for gradients, and define that all other images interpolate by cross-fading. This section describes the serialization of all new properties and value types introduced in this specification, for the purpose of interfacing with the CSS Object Model [CSSOM]. To serialize any function defined in this module, serialize it per its individual grammar, in the order its grammar is written in, omitting components when possible without changing the meaning, joining space-separated tokens with a single space, and following each serialized comma with a single space. This specification allows rendering of cross-origin images by default, which exposes some information of those images programmatically—specifically, the intrinsic sizes and resolution of those images. Thanks to the Webkit team, Brad Kemper, Brian Manthos, and Alan Gresley for their contributions to the definition of gradients; to Melinda Grant for her work on object-fit, object-position, and image-orientation; and to L. David Baron, Kang-Hao Lu, Leif Arne Storset, Erik Dahlstrom, and Øyvind Stenhaug for their careful review, comments, and corrections. The image() notation has been deferred to Level 4. The image-orientation property has been marked as At-Risk, the from-image and none keywords, and the <angle> values deprecated. The element() feature has been deferred to Level 4. The directional images feature (ltr/rtlannotations in image()) has been deferred to Level 4 to address some design-level feedback. Images referenced with unsupported URL fragment syntax are now considered invalid (and trigger fallback) within image(). The object-fit property no longer resizes the element’s content box in any cases. The image-orientation property is now inherited. There is now a definition for invalid images, which trigger fallback in the image() notation. Clarified that media fragments are only required to be supported within image() in order to satisfy the prerequisite for supporting image(). Defined how to determine the closeness of two aspect ratios (used in the definition of intrinsic dimensions). Corrected error in which image-orientation was applied after CSS transforms. The object-fit and object-position properties can no longer be aliased to image-fit and image-position. A future edition of the CSS Print Profile may allow this for printer implementations, however. There were also many clarifications and several sections were rearranged to make them easier to read. The Disposition of Last Call Comments is available.